Bruckner's Third Symphony has the most complex problems as to editions. According to the best authority I know, John Berky's abruckner.com site, Zehetmair has here recorded the "1877 Version Ed. Leopold Nowak (with Scherzo coda) ". A look at the performance statistics given on the above website confirms what my ears tell me, that this is an extraordinarily fast performance, coming in at ten or more minutes less than the most obvious comparators, like Haitink and Thielemann. The first movement for example is marked "measured, quite lively, mysterious". In Zehetmair's hands it is surely lively but neither measured nor mysterious. His unseemly haste does the great man's creation no favours. Neither Vänskä nor Solti - both of which I had to hand - are famed for moderation but both take nearly five minutes longer over the first movement alone and the increase in impact, measured, lively and mysterious, is very obvious. As given on this SACD it just seems too quick. The opening scampers along and the first climax is upon us before we have time to draw much breath. There is almost none of the vastness and grandeur that Robert Simpson refers to in his analysis of the first movement. Hans-Dieter Grünefeld, who writes the notes, seems to have been aware of the shortness because he makes the apparently-justifying comment that "historically informed performances tend to be shorter (around 50 minutes) conventional performances longer (around 62 minutes or more)." I can only assume he is also referring to the likes of Harnoncourt who takes fifty-four and a half minutes, and Herreweghe who takes fifty-three and a half, neither exceeding Zehetmair in brevity, who has set a clear record with this timing. Grünefeld also references Nicolas Couton's lengthy article Reflections on Tempo in Bruckner Symphonies which is a plea for much more flexibility. It is worth mentioning in passing that the famously disastrous first performance directed by Bruckner lasted only 45 minutes but had been subjected to additional, substantial cuts, possibly at the behest of the orchestra (! ), these cuts being on top of those between the 1873 and 1877 versions. 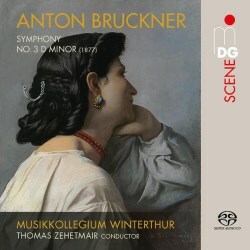 The more one hears about this infamous occasion the more sympathy one feels for poor Bruckner, who, as we know, had actually produced a fine and very original symphony. The good sound picture exposes a very modest sized orchestra. Their blurb describes the Musikkollegium Winterthur as having just under 50 members, this backed up by the booklet photograph and by information kindly supplied to me by the orchestral administration. This is very modest for Bruckner, though the Swedish Chamber Orchestra has successfully recorded the Second with even fewer strings. As for the HIP approach noted above there is no further discussion of it in the quite extensive notes and in any case the players do not use period instruments, again confirmed by them. As a comparison, when Sir Simon Rattle directed the Orchestra of the Age of the Enlightenment in Bruckner's Sixth Symphony a season ago he used little short of ninety players. There is also, according to Benjamin Korsvedt, evidence that such numbers were used in Bruckner's time for the Sixth and there is no reason to assume it was any different for this Third Symphony. It all raises questions about this present performance. The surround recording perspective has particularly impacted the orchestral balance of only 27 strings against 18 wind and brass plus the timpani. The above mentioned Swedish surround recording of the Second is closer and thus much kinder to the overall sound balance. Switching this MDG disc to SACD stereo improves matters markedly, which is interesting and worthy of further investigation were the engineers to hand. My recommendation to purchasers is to stick to the stereo. Of course, it isn't all about tempos or instruments. Bruckner's unique creations are composed for particular acoustics. The more spacious are generally best and the Stadtkirche used does sound lovely as recorded by Dabringhaus and Grimm. It is most certainly spacious and both surround and stereo recordings reflect this. This helps to make those famous Bruckner pauses work to the best effect. I would prefer to have been more positive about this well recorded, played and documented issue and been able to see it as an interesting experiment in smaller scale Bruckner. As it is Zehetmair's unwise tempi and the engineers failure to mix the surround as well as the stereo have muted my enthusiasm.